We can design an attractive and flexible database driven website geared to meet your specific needs. With the development of a CMS application (Content Management System) and secure management access, features of your site can be modified internally with no knowledge of programming, by anyone given access. We utilize many leading Web technologies allowing us to develop on many different platforms and a variety of different languages. 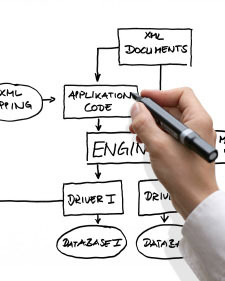 Either Unix or Microsoft hosting environments allow for our use of PHP, ASP, .NET and XML experience. We have been very successful on past projects migrating a site from an older implementation to a new dynamic database driven version with advance use of data manipulation. Why not call us today to schedule a time to discuss your needs, your goals, and your vision for your company?